When the industry speaks of human resource issues, the talk is almost always centered around the need for drivers. Yet, trucking is experiencing difficulties recruiting and retaining many other key non-driving occupations as well. In its recent research initiative entitled Beyond the Wheel, the Canadian Trucking Human Resources Council has identified eight key occupations in demand besides truck driver. The current difficulties, when combined with the forecast demand for employees in these occupations in the next three to five years, will become that much more challenging. In a recent survey of more than 1,000 carriers conducted on behalf of the CTHRC, more than 650 respondents indicated they experienced significant difficulties recruiting and retaining dispatchers, mechanics, truck and trailer technicians, supervisors and managers. The main reasons reported for these difficulties included: a lack of labour supply, the industry’s inability to pay competitive wages, and strong competition from inside and outside the trucking industry for a small number of employees. The CTHRC believes that by 2015, about 8,500 additional employees will be needed for the four positions for which most challenges are reported. 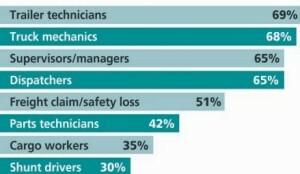 CTHRC’s research also found that a shortage of training opportunities is an issue. Technology is a particularly sensitive area with approximately three-quarters of carriers who responded indicating their truck and transport mechanics and truck and trailer technicians need training on new types of equipment, parts and/or software. It is good to see a government body notices the problems with our industry. Now how are they going to address the issue? I don’t think changing the H.O.S. will do it! Sorry, just being sarcastic. I recently acquired my Fleet Driver Trainer certification and can’t find a company requiring a driver trainer or safety officer. Now I have to climb back into a truck and hope a position will open in the near future so I can share and utilize my skills and experience in this industry. As far as driver shortage I believe we need to upgrade our training policies for driving schools. More company’s need to have training policies in place. I recently witnessed newly licensed drivers having to be retrained so they could pass company pre-hire road tests. The industry knows where the problems are, but when/how will they attempt to correct them?